« Kev Orkian – The Guilty Pianist, The Closed Venues Tour. 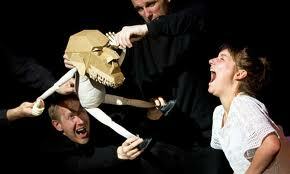 Blind Summit Theatre present three very different puppetry shows in the same bill. They do so with lashings of cheeky surrealism, flair and originality. Despite a few flat moments, the show is funny and touching in equal measure. The puppet is joined by a silent woman. The piece has an unnerving and well pitched Beckettian sense. There is strict order, but the order is meaningless. The piece ends in a slow motion physical theatre sequence which is spectacularly choreographed and exciting to watch. The puppet is shown from all angles, the skill and control used by the ensemble is terrifyingly impressive. However, these shows of prowess are less engaging in many ways than the down-to-earth humanity of the puppet with a cardboard box head and a stuffed and rag-doll like body. The second piece is an intriguing piece of light theatre. Three screens with picture frames cut into them are lined up, and a foot-lighting bar is brought in. The cast are all dressed entirely in black. They cannot be seen, but the objects they fly in front of the windows can. This section is, sadly, the weakest part in the show. The concept is not especially clever and, doesn’t quite work as you can often make out the puppeteers arms. However, the sequence is short and has some endearing moments, such as a small white face, hands and feet operated by various cast become a single running man. Finally we are treat to some ‘French Puppetry.’ All the cast become French, with cliched cigarettes and character attitudes, that are at once heighten the theatricality of the piece and are genuinely hilarious. A series of hand drawn pictures are held up, seamlessly moving from one to another, to tell a flip book style narrative. This is a deliciously silly concept excellently executed. It’s not always easy to read the smaller print, but this does not detract from the overall effect greatly. As the brief case that held the pages snaps shut with an air of finality there is well deserved and rapturous applause. Company: Devised and Directed—Blind Summit Theatre, Puppets made by—Blind Summit Theatre, Co-devisors—Ivan Thorley/Irena Stratieva, Lighting Consultation—Richard Howell, Administrator—Maeve O’Neill.